Group shipped a record 12,000 tons of galvanized steel to Europe, where it continues to win favor. The Hoa Sen Group exported 12,000 tons of galvanized steel to the EU from Thanh Hoa’s Petroleum Technical Services Port on May 30. The shipment is worth about $9 million and is the largest consignment of steel sheets ever exported to Europe by Hoa Sen. Such large exports to the EU express the ongoing efforts of the Group in confirming its stature as a dynamic business that is actively expanding export markets to regions of potential like the EU and the Americas. In March 2016, Hoa Sen exported 20,000 tons of finished products to the US, marking a breakthrough in exports by the Group in particular and by Vietnam’s iron and steel industry in general. In addition to leading the domestic steel sector, since 2008 the Group’s exports have grown steadily and reached new destinations around the world. Exports account for about 40 per cent of the Group’s total output and are one of two key sales channels, playing an important role in the Group’s development. With the goal of reaching out to the world, the Hoa Sen Group has continually sought to identify new markets. The major shipment to the EU will dock in three countries: France, Belgium, and Spain. Hoa Sen began exporting to the EU in 2012 and has seen promising development. Its products can now be found in countries such as Poland, Spain, France, Belgium, the UK, Croatia, and Russia. These are quite difficult markets, with strict standards in quality as well as delivery times. Hoa Sen has therefore given due regard to investing in modern technology to create products that conform to international standards, such as EN 10346, ROHS, and REACH from Europe. Exporting 12,000 tons of steel sheets to the EU confirms the quality and services of the Group, which not only satisfies domestic customers but also meets strict requirements in international markets. In the years to come, the Hoa Sen Group will continue to push its development in the EU, with export volumes expected to reach 10,000-15,000 tons per month. At the same time, it will seek to expand to new markets and reach out to countries with potential. 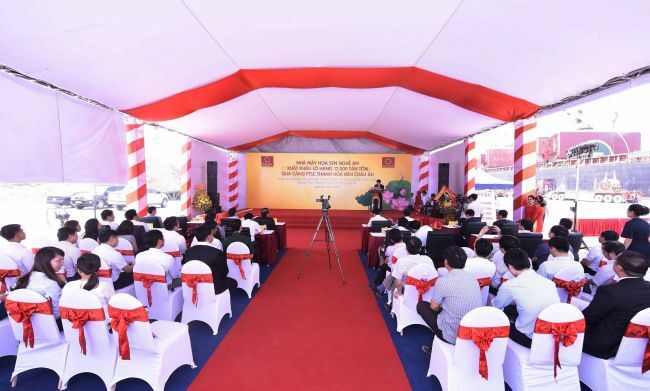 Hoa Sen is the first Vietnamese enterprise to export 12,000 tons of steel sheets to the EU, marking a new stage of development in the Group’s export activities. It is the result of continuous efforts to increase iron and steel exports, with the Group actively enhancing its internal resources, seeking new markets, and welcoming integration. As at the end of fiscal year 2015-2016, the Group’s exports stood at 478,000 tons, up 17 per cent compared with 2014-2015. Its products are now available in more than 70 countries and territories worldwide. In 2016-2017, it aims to further boost sales in the domestic market, diversify its export markets, and affirm its stature as a growing global business.